March 31, 2009 – Parents and school nurses take note. Lice are a familiar nuisance around the world and vectors of serious diseases, such as epidemic typhus, in developing regions. New research indicates that lice may actually be quite unique in the animal world. In a study published online in Genome Research (www.genome.org), scientists have analyzed the mitochondrial genome of the human body louse and discovered that it is fragmented into many pieces – a remarkable finding in animals that will surely spark discussion about how it evolved and what advantages it might confer. 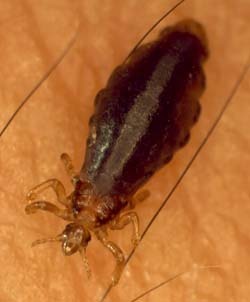 The lice that plague humans (head lice, body lice, and pubic lice) fall into the category of "sucking lice," feeding on the blood of the host. Scientists have recently sequenced the genome of one of these sucking lice, the body louse (Pediculus humanus). With the louse genetic code mapped, researchers will be able to develop new strategies for treatment and prevention of infestation. Importantly, these sequencing efforts also included the P. humanus mitochondrial genome (mtDNA), and detailed analysis has revealed how genetically extreme these creatures are. In this study, scientists from the University of Queensland and the J. Craig Venter Institute found that in stark contrast to the single circular mitochondrial chromosome typical of most animals, the human body louse has evolved a set of 18 "minichromosomes." While multiple mitochondrial minichromosomes have been previously described in plants and protists, this is the first report of an animal adopting a highly fragmented mtDNA structure. A female human body louse (Pediculus humanus corporis) on human skin after blood feeding. Photo courtesy of Richard Webb (Centre for Microscopy and Microanalysis, University of Queensland) and Renfu Shao (Parasitology Section, School of Chemistry and Molecular Biosciences, University of Queensland). The group also looked at mtDNA structure in other sucking lice, including human head and pubic lice, as well as sucking lice that infest other primates, and found that the mtDNA of these lice is also fragmented. Interestingly, they report that "chewing lice," closely related lice that feed on the hair or feathers of other animals, do not have fragmented mtDNA chromosomes, suggesting that multiple minichromosomes may have coevolved with blood feeding. Dr. David Rand of Brown University, a mitochondrial DNA evolution expert, said this exciting discovery raises new questions in the field. "Why is it restricted to this lineage? Why don't we see transitional stages of this organization in related lice?" Rand also asked whether fragmented minichromosomes has implications for gene regulation. "Does this organization provide an advantage for more control over individual gene expression in mitochondrial genomes?" Rand noted that this work and the intriguing questions raised will motivate researchers to take advantage of new technologies to investigate the mtDNA structure of other animals. "As new sequencing tools allow researchers to move away from single-gene studies to whole genome analyses of mtDNA, we may see that the sucking lice story is more common than we expected. "Scientists from the University of Queensland (Brisbane, Australia) and the J. Craig Venter Institute (Rockville, MD) contributed to this study. This work was supported by an Australian Postdoctoral Fellowship from the Australian Research Council and an Early Career Researcher grant from the University of Queensland. Renfu Shao, Ph.D., lead author of the study, is available for more information by contacting Ms. Jan King, Communications Manager for the University of Queensland (j.king@uq.edu.au; +61 7 3365 1120). Shao, R., Kirkness, E.F., and Barker, S.C. The single mitochondrial chromosome typical of animals has evolved into 18 minichromosomes in the human body louse, Pediculus humanus. Genome Res. doi:10.1101/gr.083188.108.